Ted discussed how the presidents of the Union and the Confederacy approached the war in terms of weaponry and objectives, offering fresh and often humorous insights on Lincoln and Davis, their chief subordinates, the choices they made, and the challenges they faced as they fought the Civil War. Theodore P. Savas graduated from The University of Iowa College of Law in 1986 (With Distinction). He practiced law in Silicon Valley for twelve years before moving to El Dorado Hills. He co-founded Savas Woodbury Publishers (subsequently Savas Publishing) in 1990 with David Woodbury, and is the owner and managing director of Savas Beatie LLC, one of the largest independent Civil War publishers in the world. He has been teaching legal, history, and business college classes since 1992, and is the author or editor of fourteen books (published in six languages) including A Guide to the Battles of the American Revolution, Hunt and Kill: U-505 and the U-Boat War in the Atlantic, and Silent Hunters: German U-boat Commanders of World War II. While in San Jose he founded the South Bay Civil War Round Table in 1989; its first meeting of four people was held in his living room. This entry was posted in Meeting archive on April 25, 2015 by hlj. Civil War Quiz: What Do You Know About Pickett’s Charge? Q#1 – What were the names of the three Confederate Division commanders in Pickett’s Charge? Q#2 – On Cemetery Ridge, which Union Corp was the target of the Confederate assault and who was the Corps Commander? Q#3 – Which Union division was directly in the center of the Union line on Cemetery Ridge? Q#4 – What other military action did Lee plan to initiate concurrent with the infantry attack on Cemetery Ridge? Q#5 – Approximately how many Confederate cannons were used to bombard the Union Line on Cemetery Ridge prior to Pickett’s Charge? Q#6 – What are the three main reasons given for the ineffectiveness of the Confederate bombardment of the Union Line on Cemetery Ridge prior to Pickett’s Charge? Q#7 – What was the name of the general in charge on the Union artillery? Q#8 – What was the reason there was little or no close artillery support provided by E. Porter Alexander’s artillery once the Confederate infantry actually began to move toward the Union lines? Q#9 – What is the current most accurate estimate of the number of Confederate infantry troops that actually made Pickett’s Charge? Q#10 – Of the 3 main divisions involved in Pickett’s charge, how many Confederate brigades were involved? Q#11 – As the Confederate infantry lines approached Cemetery Ridge, what were the Union troops on Cemetery Ridge heard to be shouting at them? Q#12 – Which Union regiment attacked Confederate General Brockenbrough’s brigade on the left flank of Pickett’s Charge causing the Southerners to retreat back to Seminary Ridge? Q#13 – What was the name of the Union brigade that delivered devastating musket fire into the right flank of Pickett’s division as it attacked up the slope of Cemetery Ridge? Q#15 – What were the approximate number of Union casualties resulting from Pickett’s Charge? What were the Confederates? This entry was posted in Quiz on April 22, 2015 by hlj. Any time is a great time to consider Abe Lincoln and his story. Thus I thought as I rediscovered the book, “Lincoln: his Life in Photographs” by Stefan Lorant, done in 1941. I’d buried it away in one of my sheds many years before and after a quick read I could see what an opportunity it presented to view Old Abe’s journey from the back woods to greatest American in the District of Columbia. Soon I was putting together a digital slide show for presentation to the Round Table from the pages of Lincoln’s images which had taken him 19 years to assemble. Lincoln was born well before photography and grew to mid age without expecting to see images of himself or most people he might meet, other than in fleeting representations in a mirror. Expensive painted miniature portraits were in vogue in the best of families, and also oil portraits and chalk drawings or engravings but average people didn’t spend hard money on such unchanging luxuries. Then things changed in 1840 when the daguerreotype came to America, but Abe was slow to take to the process. In 50 pictures we’ll trace Lincoln’s life and accomplishments photographically as he adjusted to and learned to use the new medium. Mythic tales and questionable facts must yield to the new documentary evidence we have all come to know and expect in this digital age. Please bring your vast knowledge and ready experience concerning President Lincoln to share as each photo might warrant. 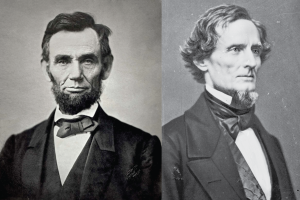 We’ll see old familiar images and unusual or forgotten ones, any of which may spark unexpected comments and shared insights about Mr. Lincoln and his times. This entry was posted in Meeting archive on April 20, 2015 by hlj. Q#1 – How many “major” battles were fought during the Seven Days Battles? Q#2 – What are the names of the “major” battles that were fought and in what sequence were they fought? Q#3 – What was the name of the minor battle that was fought on June 25 that signaled the beginning of the Seven Days Battle? Q#4 – What was the name of the farm where on June 28 Confederate General Brig. Gen. Robert A. Toombs’s brigade was severely battered by the Union 49th Pennsylvania and 43rd New York regiments? Q#5 – After a major battle was fought on June 26, what was the number of Confederate troops that Union General McClellan reported to Washington that he estimated he was facing? Q#6 – What are the other two names given to the Battle of Gaines’s Mill? Q#7 – Of the “major” battles fought during the Seven Days Battle, which is the only one that was a clear-cut Confederate tactical victory? Q#8 – What was the name of the railroad line where the Battle of Savage’s Station was fought? Q#9 – What was the name given to the first instance of an armored railroad battery to be used in combat by the Confederate Army? Q#10 – At the Battle of White Oak Swamp, what Confederate government official came under artillery fire and had to be ordered from the field by AP Hill? Q#11 – Which Union General prepared the Union positions on Malvern Hill? Q#12 – How many Union cannon were placed on Malvern Hill to repulse the Confederate attack on July 1? Q#13 – What was the name of the location on the James River that Union General McClellan retreated to after the last engagement of the Seven Days Battle? Q#14 – Which side incurred more casualties during the Seven Days Battle? Q#15 – After the end of the Seven Days Battle, the Army of the Potomac encamped around Berkeley Plantation. What was the name of the US President who was born there? This entry was posted in Quiz on April 19, 2015 by hlj. California’s involvement in the American Civil War remains one of the great hidden facets of that conflict. Yet it is rich by the value of its unique contribution to the Union war effort and resemblance to national trends throughout that period. Background and Military Situation in April 1861 was the first of a five-part series concerning California and the war. This series considers all aspects of the state’s involvement from a military perspective. Subsequent presentations discuss Californian U.S. Volunteer Units, U.S. Navy in California, Military Bases in California, Famous Californian Generals, Military Operations and Aftermath (1861-66). This is a fresh reevaluation of an old subject utilizing new material available on the Internet supplementing numerous traditional original and secondary sources. This series reveals that our pre-war history is more complex and wartime contribution is greater than generally appreciated. Background and Military Situation in April 1861 put these wartime experiences into perspective by highlighting key economic, military and political events within California leading up to the war. Discussion started with a condensed military history of Spanish and Mexican California culminating in the Mexican-American War of 1846. Initial political divisions and U.S. military presence in California begins in this period. Next, discussion led to the state’s political history before the war. This revealed that California entered the Union as an anti-slavery state in 1850, but strong Southern influence moved the state into the “pro-slavery” camp by 1860 as part of the Southern national agenda to defend slavery. Finally, the state’s military situation in April 1861 was highlighted. The U.S. Army, U.S. Navy, California State Militia, and Secessionist Militia were each individually summarized. Special attention was given to the obscure Santa Clara County state militia and the secessionist militia companies. This revealed that while pro-Southern politics became dominate by 1860, it was also a “house of cards” as its leadership and most-radical followers fled the state after Fort Sumter and Union patriotism blossomed in April 1861. This topic is of special interest to the author. Bob is a native California, born and raised in Santa Clara County. He is also a lifetime student of the Civil War. He had the opportunity to visit many Civil War sites from Florida to Pennsylvania to New Mexico during his 30 year military career. Like many California CWRT members, he desires to understand his home state’s role in the war. He started collecting material for this presentation ten years ago and initiated a serious study 15 months ago. This series documents his research in great detail. Time allows only a few key points from each slide to be presented. Numerous period photographs and magazine drawings are included for visual effect with the intent of comprehending California’s role in the Civil War. This entry was posted in Meeting archive on April 15, 2015 by hlj.